The Great American Ball Park's locker room has never looked so ready for the big show! 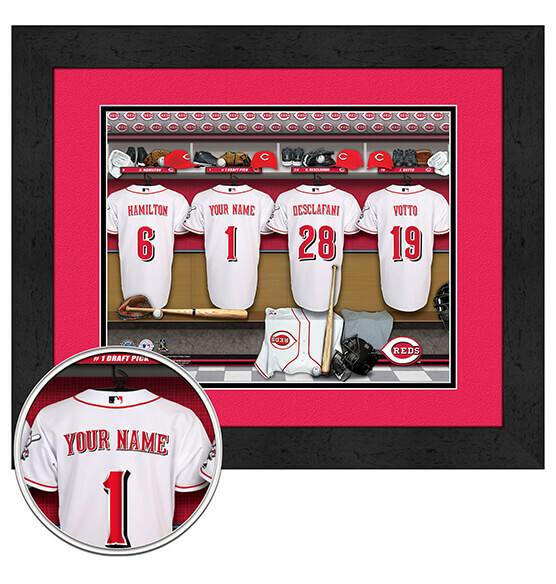 You'll stand among other Reds superstars thanks to this easily customizable print that personalizes the back of one of the four jerseys with the name you choose (up to 12 characters). Our premium sports decor looks great in any room with its digital double mat in team colors, its MDF vinyl-wrapped frame, high-quality paper and glass. For the Major League Baseball and Cincinnati Reds superfan in your life, you can't go wrong when you purchase this gift that's destined to knock it out of the park!